The arts make more things possible, from better education to greater health outcomes, to a more civically-engaged citizenry—but people don’t always see those connections. Either on the Web, or through mobile devices, users can spin through a colorful ring of areas (like Health & Wellness, Housing, and Civic Dialogue) to find out how the arts impact and intersect with our lives. There are even ways to get additional fact sheets to dig deeper into each Art/Life connection. This highly interactive, visual tool is meant to drive conversation, and is accompanied by customized Fact Sheets that are downloadable and printable for sharing with board members, public and private sector policymakers, and more. It also is mobile-friendly and allows for easy conversations with decision makers to help expand the dialogue about the arts and their value to communities. Functioning as the surface of a deep “lake” of knowledge, all impact points and research within the Explorer comes with citations and links so that people can visit the websites of all the example projects, click directly to the research referenced, and engage directly with the other partners doing this work around the country. The Arts + Social Impact Explorer is a great tool to start a conversation with funders or policy makers about the deep ways that arts organizations connect to the fabric of civil society. It will also be a boon to grant writers everywhere! If you'd like to find out more about the development and use of the Arts + Social Impact Explorer tool you can view this quick YouTube introduction. 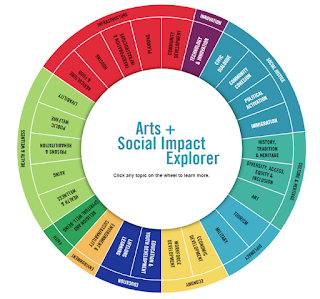 But really the best way to experience all the features of the Arts + Social Impact Explorer is to take it for a spin yourself by clicking over to the Americans for the Arts website.